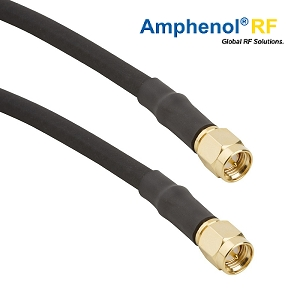 Amphenol RF has introduced a new line of SMA fixed length cable assemblies using LMR195 and LMR-240 cables. These cable assemblies combine precision machined SMA connectors with high performing LMR cables developed by Times Microwave, an Amphenol company. The pre-configured cable assemblies are designed to offer a lower loss option with superior electrical performance to standard cables. The LMR Cable Assemblies operate between DC to 6 GHz and are ideal for wireless communications systems and high performing applications such as base stations, antennas, and other telecommunication devices. The cable is constructed with a black polyethylene jacket, closed cell foam poly dielectric, and bonded tape conductor. All of these components work together to make the LMR cable more rugged compared to other braided cables. The 50 Ohm SMA connectors feature brass construction with gold plating. straight plug to bulkhead jack and right-angle to right-angle plug configurations. They are also available in standard imperial lengths of 6, 12, 18, 24, 36, and 48 inches, along with metric lengths of 0.25, 0.50, 0.75, and 1 meter. Custom lengths are available upon request. To learn more, click here.